My fascination with pottery started at an early age. I was in middle school and dreamt about becoming an archeologist, in part, because I liked looking at ancient pots. While that dream is yet to be fulfilled, my interest in pottery never abated, it only grew. By the end of nineties, I was learning the wheel throwing, and there was no looking back. I took my first proper wheel throwing class in 1998, and I have been making pots and other lovely pottery ever since. I have been an avid student of many talented local and visiting ceramics artists for the past 14 years and have been teaching wheel throwing myself. People from all walks of life have taken my classes at various local studious. In my own body of work, I try to achieve a balance between two main qualities, function and aesthetics, each being equally important to me. I believe that, just like the works of the ancient potters, each finished piece has to combine usefulness and beauty in the most natural and seamless way. My pottery is functional, everyday ware for serving and eating meals or for making flower arrangements. When I make my pieces, I think about how they will be used, and about designing and making them in such a way that their owners would want to use them, with pleasure, for a very long time. No detail is too small. 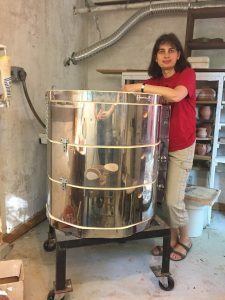 Choosing rims and feet at the end of the throwing process, adding attachments and making alterations, and even deciding on the weight of an empty pot, are all necessary points of consideration. I like to play with combinations of color and texture on the finished surface. A lot can be achieved with just using simple contrasting clay slip, texturing tools and a minimal combination of glazes. What makes it fun for me is a continuing process of developing my own style. I thought I would be discovering pots and, instead, I discovered pottery! As a young girl growing up in Russia, I was privy to learning the splendid history of Russian crafts. This included the royal jewelry collections that were displayed in the Kremlin museums in Moscow. Russia has rich traditions of using gemstones from the Ural Mountains and silver from Siberia. These beautifully made collections had a profound influence on my love for the craft. For more than a decade I have been making my own jewelry for myself and my friends and family. Now, as time has gone on I offer my creations to you. Each piece I make is original, and there are never two pieces that are exactly alike. I use semi-precious gemstones, handmade glass bead (I make my own), and real pearls and corals. I accent with precious metals and silver beads from Bali.